Hope you had a wonderful Thanksgiving. Just wanted to let you know that we had a leaky pipe in our kitchen this afternoon. We called up Wickersheim & Sons at 1:30, two nice guys showed up in an hour with the right parts and pieces, and fixed it up. Great service on a holiday weekend! 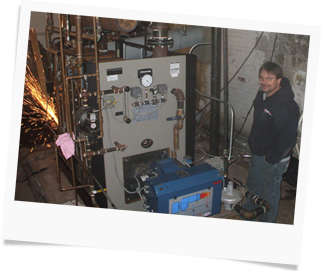 When it comes to steam heating systems and boilers, Wickersheim & Sons has over 80 years experience in the maintenance, repair, service and replacement of all major brands of steam heating equipment and all different types of systems. Vapor Vacuum, one pipe or 2 pipe, we tackle it all. 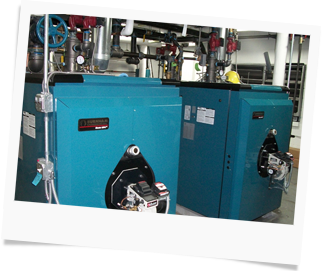 We also service hot water boilers or hot air heating systems. Our service technician’s are seasoned in all types of repairs and maintenance on your system and can explain any available ways to gain in efficiency and reliability. Boiler replacements are no problem for us. Whether you have an office building, church, school, apartment house or industrial building we can respond quickly to resolve your problem. All brands of steam traps repaired and or replaced. Ask us how much money a year we can save you with new steam traps in your building.